Signorelli was born in the town of Cortona in the province of Arezzo in Tuscany under the birth name of Luca d'Egidio di Ventura. His exact date of birth is unknown but c. 1441 is a popular estimate. He was Influenced by artists such as Perugino and Piero della Francesca, painters who had been influenced by Florentine art but who had not been directly involved in the Florentine scene. He is famous for his studies of the naked human form and for his foreshortening techniques. Little is known about his private life, Vasari describes him as a kindly, family man who lived more like a nobleman than a painter. Signorelli was one of a group of artists summoned by Sixtus IV to decorate the walls of the Sistine Chapel, the artist's contribution was 'The Testament and Death of Moses' painted in collaboration with Bartolomeo della Gatta, this was his first major commission. 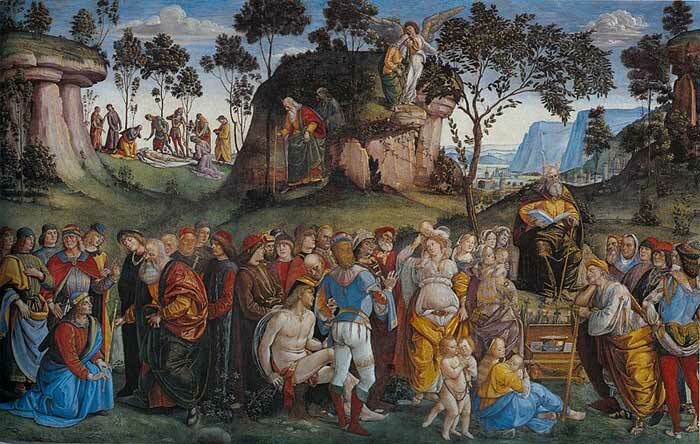 Signorelli's trip to Florence in or around 1490 resulted in a commission from Lorenzo de' Medici, the painting known as The Court of Pan. The half-human half-goat figure of Pan sits enthroned in the centre of the picture, the other figures are all human. On each side of Pan are two elderly male figures, both holding a staff. A younger male figure stands before Pan Playing a pipe and another reclines at the feet of the god. The painting was destroyed by allied bombing in WWII. This scene shows the Virgin, seated on a throne, reading a bible while the infant Jesus holds a white lily, a symbol of purity. The saints John and Lawrence are placed at each side of the mother and child. In the foreground St. Onofrius and St. Herculanus are separated by the central figure of a lute-playing angel. Considering Signorelli's keen interest in the human form some of his figures in this work seem a little experimental and disjointed. The pot-bellied angel with the spindle legs is unflattering, while St Onofrius is depicted as a withering example of old age. 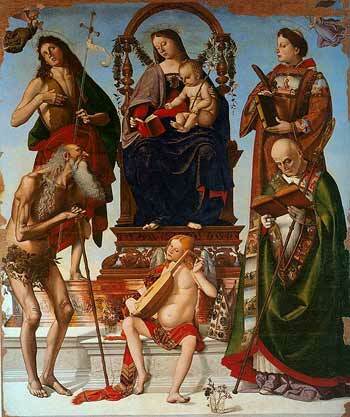 However, the work was accepted as an Altarpiece despite the awkwardness of some of the figures! Ouch! There are thought to be many portraits of famous renaissance personalities within the Antichrist. 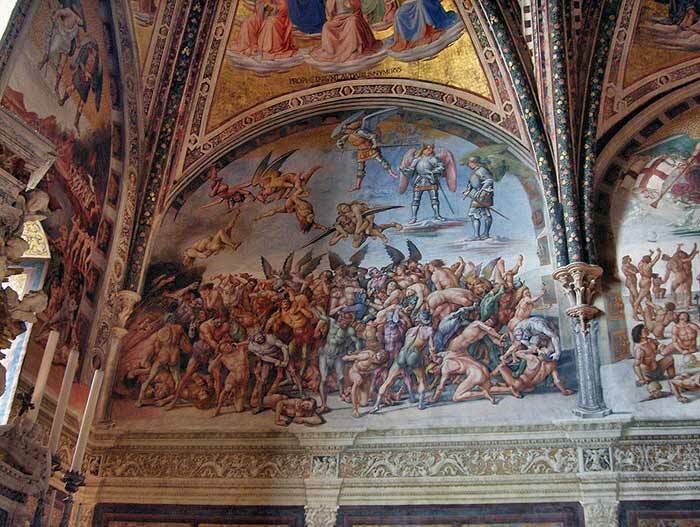 These include Raphael, Christopher Columbus, Cesare Borgia, Dante and a self-portrait of the artist. 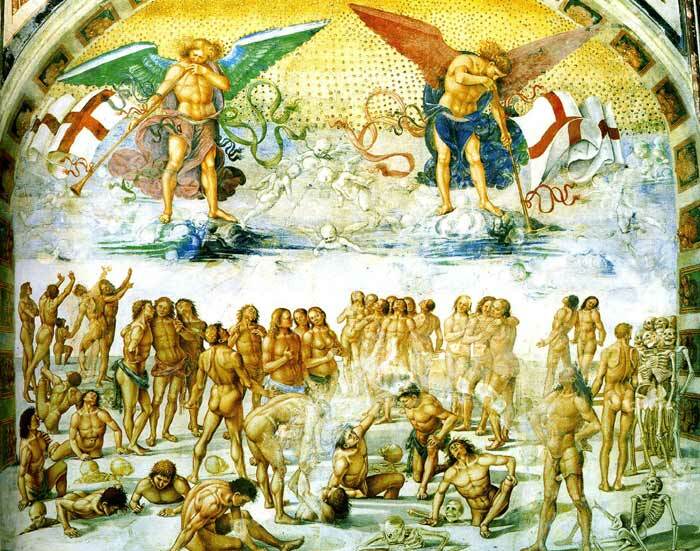 The following three images (The Damned, The Resurrection and the Elect) all display an impressive number of male and female nudes. It is clear that the artist had made extensive studies of human anatomy even to the point of dissecting dead bodies. His figures twist and turn, bend and stretch, gesticulating in all manner of positions in what is a magnificent study of the human form. 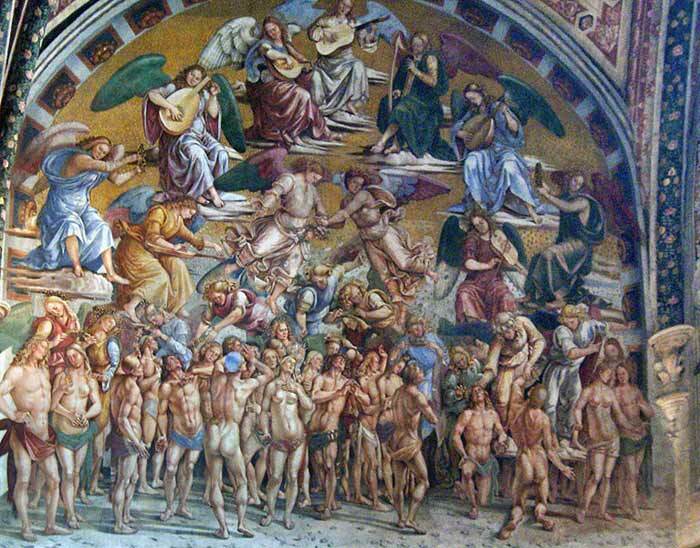 Michelangelo was greatly influenced by these works and even used Signorelli's frescoes as a reference point when completing his own great masterpiece, The Last Judgement in the Sistine Chapel. 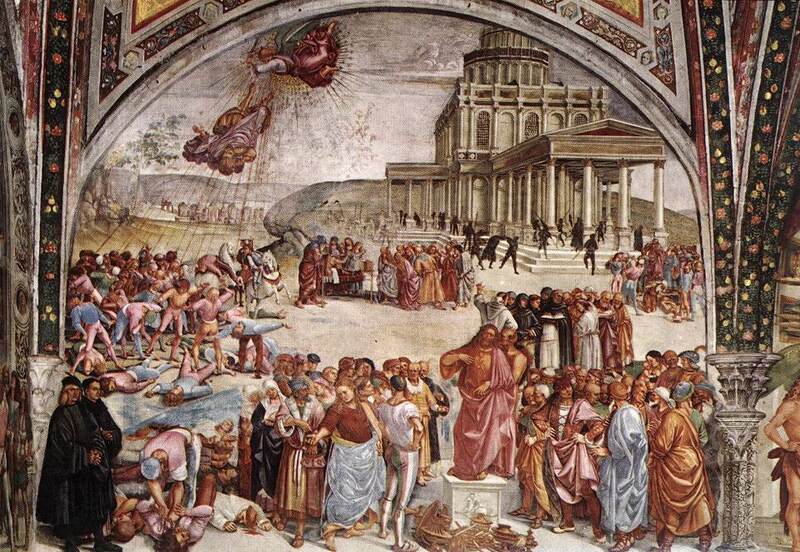 In 1508 Pope Julius II required artists to decorate the Vatican Palace. He summoned Signorelli and other artists such as Perugino and Pinturicchio but their work was removed in favour of Raphael's designs. 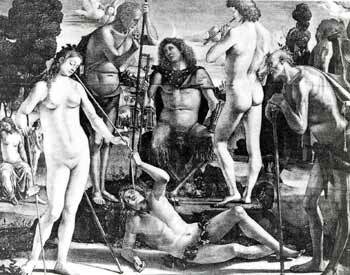 Signorelli returned to his hometown of Cortona and was much sought after by various patrons. The artist was in poor health and was partially paralysed. His paintings in these latter years did not reach the heights of his earlier work but he remained a leading citizen of Cortona until his death on 16th October 1523.